The youngest person to sail solo around the world returned home Thursday from his 30,000-mile, 282-day ocean journey. Mike Perham, 17, sailed into Lizard Point in Cornwall, the southernmost point in Britain, at 9:47 a.m., his race team said. “It feels absolutely brilliant,” Mike told CNN by phone hours before crossing the finish line. “I’m really, really excited to be going across the line at last. 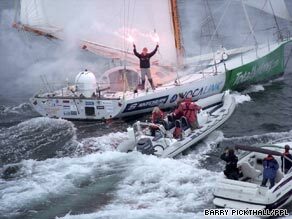 It doesn’t feel like long since I crossed it first.” Mike set off on his round-the-world trip on November 18, 2008. He has been sailing his yacht, TotallyMoney.com, single-handedly, though a support team has been sailing next to him along the way. The teen has now achieved the title of Youngest Sailor to Circumnavigate the Globe Solo and Supported, according to the Guinness World Records. Mike learned how to sail when he was seven years old from his father, Peter and at age 14, he sailed across the Atlantic alone. The teenager’s school — which Mike describes as “highly supportive” of his trip — has redesigned his coursework to fit in with his trip. It also gave him some coursework to do during “quiet moments,” according to Mike’s Web site. There haven’t been many of those quiet moments. Repeated autopilot failures forced him to stop for repairs in Portugal, the Canary Islands, South Africa, and twice in Australia, according to his Web site. Bad weather in the Southern Ocean — between Australia and Antarctica — forced Mike to battle 50ft waves and 57 mph winds. He said at one point, a “freak wave” picked up the boat and turned it on its side. “My feet were on the ceiling at the time,” he told CNN. “That was a really hairy moment, and I was certainly thinking, ‘Why am I here’ But we took the sails off and the day after I thought, ‘This is brilliant! '” Mike describes his father as his biggest hero, always supportive of what he wanted to achieve. Peter Perham said he wasn’t too worried about his son facing dangerous situations at sea, as long as he knew what to do and stayed safe. Is it irresponsible of parents to allow their children to embark on potentially hazardous expeditions Tell us below in the SoundOff box “We’d always discussed all these things, the what-if situations, like being knocked down,” Perham said. “The most important thing to me is obviously Mike’s safety at all times and is he all right. And as long as he’s got a strong boat — and it is definitely a strong boat [though] it might have had some technical problems — I just thought well, he’ll be fine.” Mike recorded his trek in a blog and in videos posted on YouTube. Because of the physical demands of the trip, he had to double his daily calorie intake to 5,000 and eat every hour, he said on his Web site. He ate a lot of pasta and rice, cooked in a small galley on board, but most of his calories came from freeze-dried food. Mike slept in 20-minute intervals, with the boat’s autopilot taking over while he slept. The record-setting teenager said he looked forward to stepping on dry land again, though he’d probably miss the ocean. “The highlights are just incredible,” he said. “I’ve seen some amazing sunsets. I’ve seen groups of over 100 dolphins just jump up alongside the boat. And at the same time, I’ve seen some amazing storms, which just really makes you wonder in awe at the ocean.” Mike said he has “lots of ideas in mind” about his next adventure, but for now he said he’s looking forward to catching up with his friends and getting back to school. As Mike sets a record, another European teenager is hoping to break it. But 13-year-old Laura Dekker of the Netherlands faces a court battle before she can attempt a trip around the world by herself. Dutch social workers have taken legal action to try to make Laura a ward of the court so that her parents — who support her sailing plans — temporarily lose the right to make decisions about her. A Dutch court is due to issue a decision in her case Friday.